Some days are simply memorable. April 28th of 2012 was like that to me. My typical day doesn’t consist of friends from other cities visiting, but when they do, I’m really happy to tag along and show them around. I get to enjoy a perfect opportunity to be a tourist in my city, and see my world and their world coexist and mingle while we walk down the streets of my home ground. So when K, my friend from high school, came to visit me from Beijing last month, I was excited to join her new adventures. The first picture of the day is of her thoughtful gift to my family. 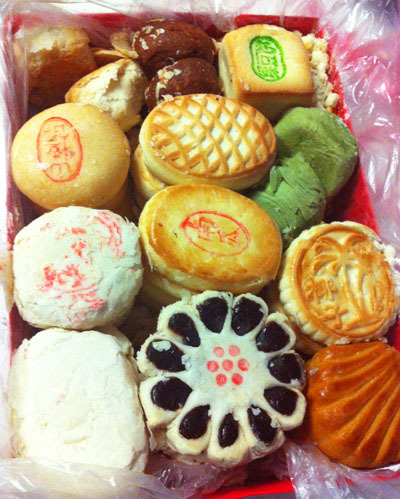 She brought us these lovely traditional Chinese pastries all the way from Beijing. They were as great as they looked. After dropping off her stuff at a hostel, we decided to go see an event that another friend of mine was hosting: the Hanbok Parade. 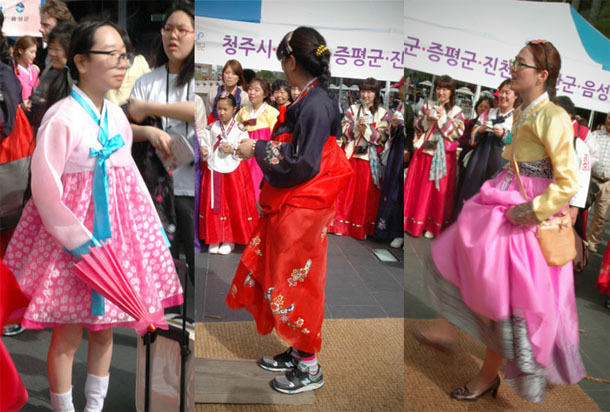 Hanbok is the traditional Korean clothing. 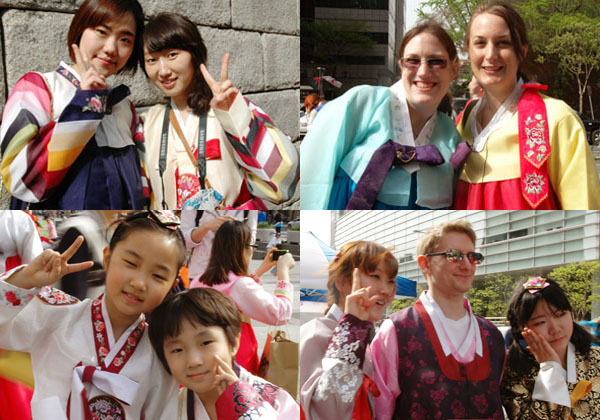 Many Koreans, including me, find it difficult to wear hanbok on a regular basis because it’s thought to be inconvenient in most situations. I wanted K to meet the event’s organizer, Michael. A former New Yorker now living in Seoul for seven years, Michael is famous for his hilarious and yet deeply insightful and memorable music videos about Korea. (I’ve linked his Seoul subway music video to my first post on H&L). Many people let me take their pictures. Thanks guys! Michael says he came up with the idea of the Hanbok Parade to give people more reasons to wear hanbok on the streets of Seoul. It seemed like his idea inspired both Koreans and non-Koreans alike because many people, regardless of their age and nationality, joined the parade. As K and I talked and walked with the hanbok crowd, people on the streets waved and cheered at us. and folks who boldly combined hanbok and more modern concept of fashion. 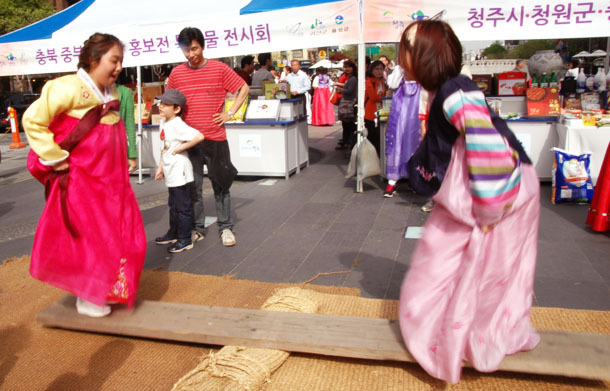 We also saw some of our hanbok ladies trying neoldduigi (traditional seesaw jumping). K bravely gave it a try, but couldn’t stand on it for long. It’s actually much harder than it seems. After walking over 3km, the parade finally arrived at the last destination, Gwanghwamun. The hanbok crowd took a group photo in front of King Sejong the Great. They really caught the eyes of everyone around. K and I bid goodbye to the group after that because we wanted to take a look at a small museum underneath the statue of King Sejong. 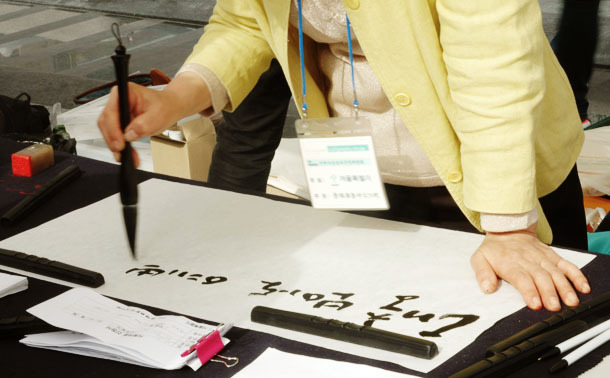 The museum is a nice place to learn about King Sejong, the Korea’s most beloved leader, and his greatest invention, hangul (Korean alphabet). 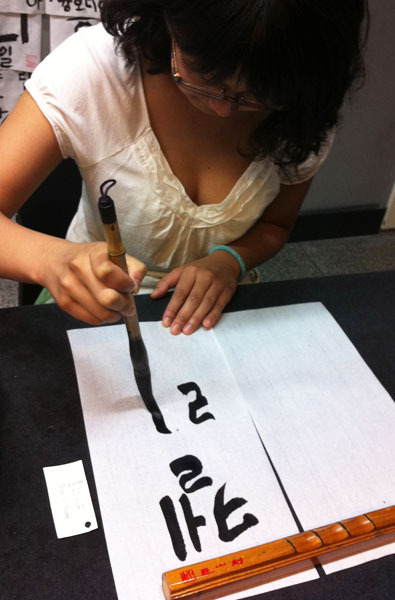 K learned to write her name in Korean in just few minutes. I keep telling everyone that’s how easy it is to learn hangul! 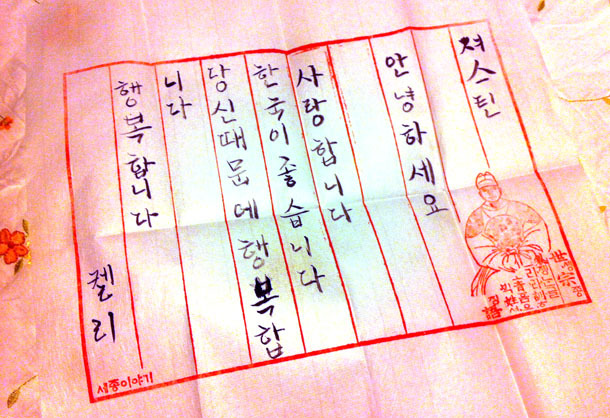 And as I was writing this post, K’s hangul letter arrived in my mailbox. She wrote a short letter to me in the museum and the museum sent it to my address. It read: “Hi Justine. I love you. I like Korea. I am happy because of you. K.” Photographs and letters help recall memorable moments in life. And a photograph of a letter? I’m sure it will, if not more. This entry was posted in Explore, Seoul and tagged 10 things, hanbok, justine, Korea, photos, Seoul. I really like them too! Date ones were sooo goood. Thanks for reading! Oh Korea in spring! 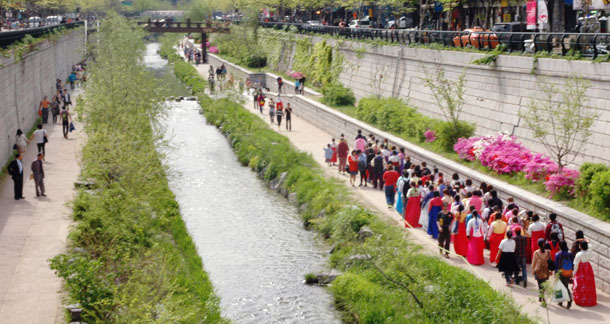 The hanbok parade sounds like a ton of fun. I love the modern interpretations of the dress. Thanks for the post! Spring and fall are the best seasons to visit Korea, I think. Thanks for reading! I know, it’s a shame that they’re also the shortest. Yeah, it already feels like summer here.